Before we started the meal, I was warned by my hosts that it would be a big meal. “Nobody leaves Haj Kahil hungry.” were his exact words. 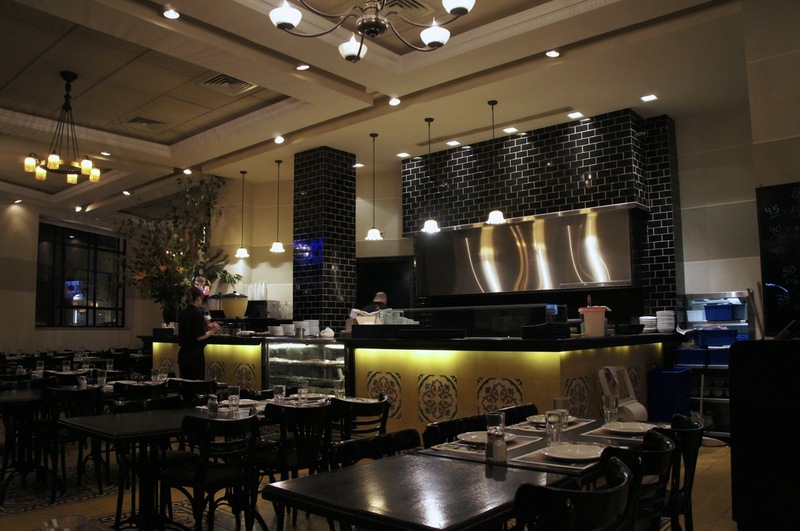 Haj Kahil is an Arabic restaurant found in the centuries-old town of Jaffa. For those unacquainted with Jaffa, this was known in recent history by Napoleon and ancient history by the prophet Jonah. For years, this district retained its Arabic communities that stayed back even after the establishment of the Israel state. Haj Kahil has been passed down from one generation to another and has remained in the family for over 40 years. The Kahils have stayed in Jaffa for over 120 years, and worked as carriage men. The location of the new restaurant was historically a carriage station. Hence, the logo of the restaurant was such. 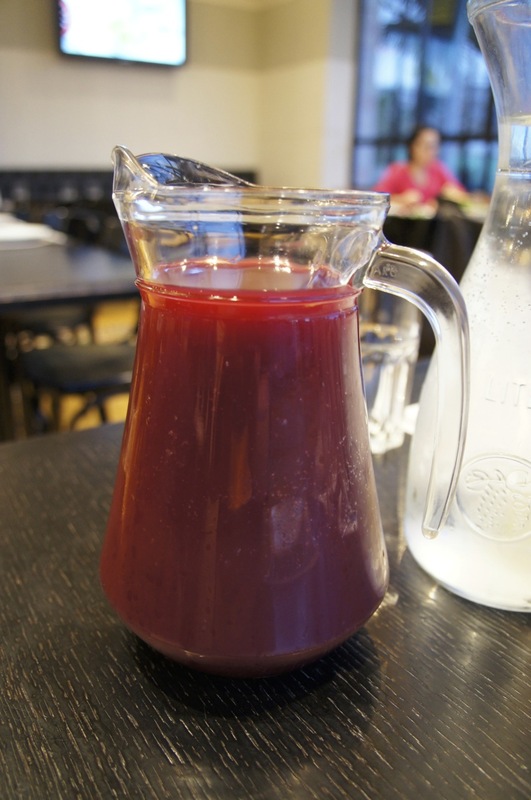 Pomegranate can be found in abundance in Israel, and I had never had this fruit freshly juiced in this way. It’s tangy and not as “siap siap” (bitter aftertaste) as eating the fruit itself. Of course, no having to negotiate the seedy fruit was an added advantage of having it juiced. 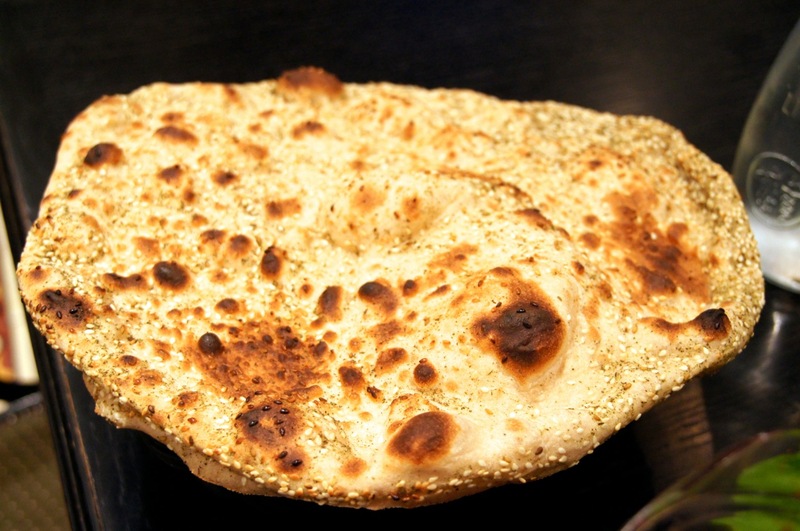 Pita breads were baked on the spot using large open fire stoves in the restaurant. Due a very good design, the place was not smoky and you will not leave the restaurant smelly like smoked duck. Pita bread was the main starch that accompanied our meal until the serving of the stuffed meat. You eat the pita with hummus, labna and other savouries that you scooped liberal amount with the warm pita bread. There were a lot of variety of salads available daily, and the choices vary according to the season. 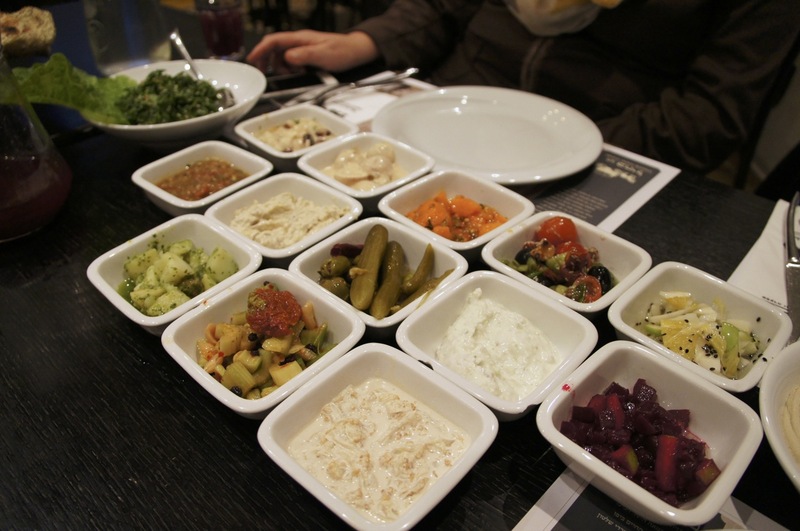 Hummus, tabbouleh, home made pickles and labna are staples. I particularly enjoyed the beets and pickles (not too sour). This was the best hummus I have tasted by far (when compared to those we got from Singapore supermarkets). 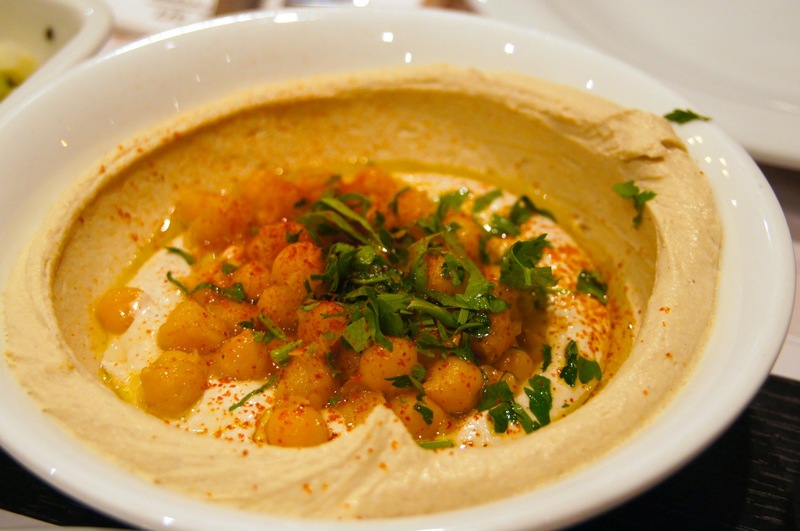 Of course, when I mentioned this to my hosts, the debate on where you can get the best hummus ensured. This reminded me of the scene from an Adam Sandler’s movie that have the Arab and Jewish world all engaged in discussing that my mother’s hummus was better than yours. 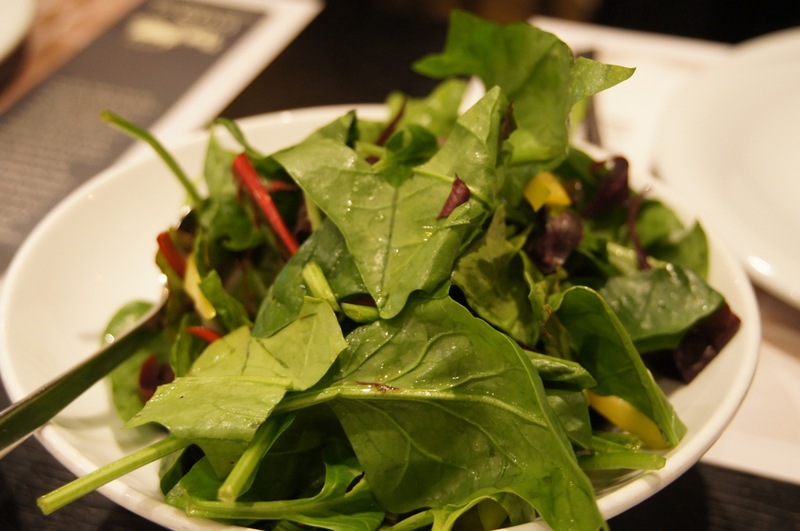 Juliennes of beetroot, peppers tossed with baby spinach in a balsamic vinegar sauce, the green salad was a commonplace in meals in Israel because of the abundance agriculture that resulted in the desert country. This did not come as an accident or naturally. It was through years of careful planning by the Israeli government, through desalination and irrigation of the deserts , agriculture becomes a reality in this arid, middle eastern landscape. Yes, we almost forgot that Israel IS actually more Middle East than Europe. 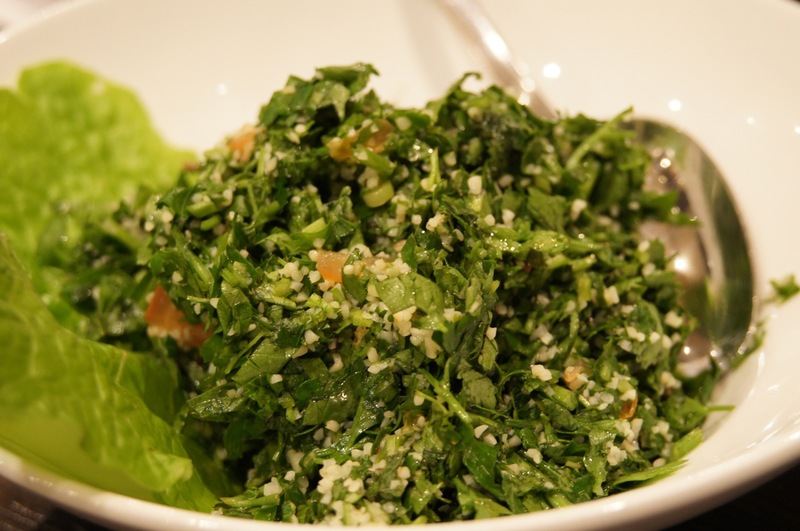 Tabbouleh is an Arab salad traditionally made of bulgur, tomatoes, cucumbers, finely chopped parsley, mint, onion, and garlic and seasoned with olive oil, lemon juice, and salt. Bulgur is a cereal made from durum wheat and has a texture like couscous. Didn’t quite get this in Singapore, so was quite unfamiliar in the texture or taste. The mains that followed were quite amazing. 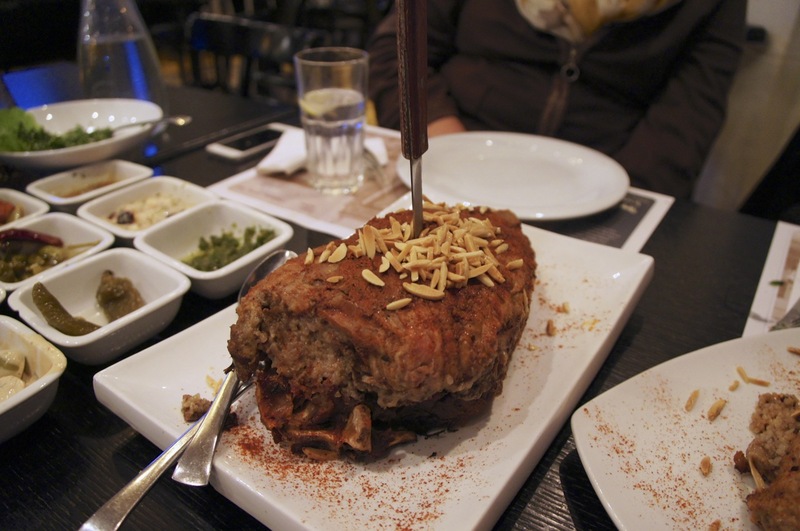 First came a whole roasted leg of lamb stuffed with dried figs and pine nuts and roasted for seven hours. 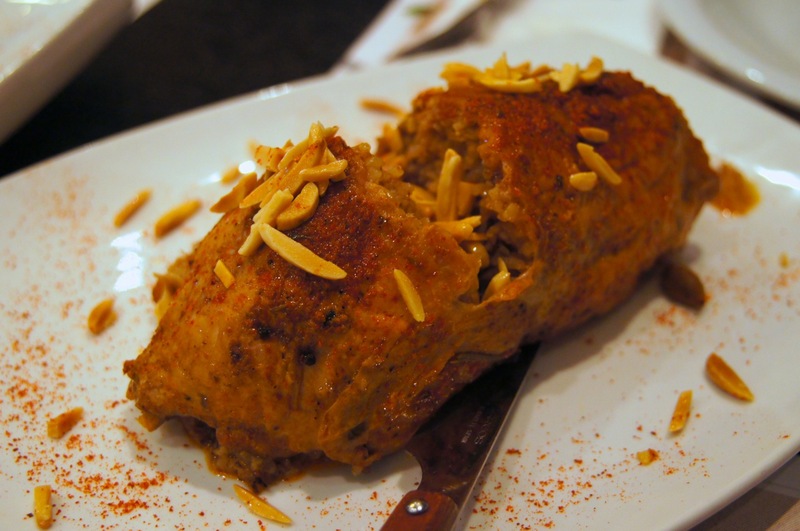 Similar to stuffed lamb briyani except a totally different taste, the stuffing also included rice and spices. The meat crumbled off and accompanied the flavourful rice in a wonderful combination. Spice and nuts, rich meat vs light fluffy rice, it was a filling and tasty dish. I finally understood why one will not leave this place hungry, because this portion for 2 can easily feed 4-5. The chicken was done in a similar fashion as the lamb leg. This was specially for this who did not like the gamey taste of lamb. However I felt that chicken did not do justice to this dish as it did not come across like the lamb. 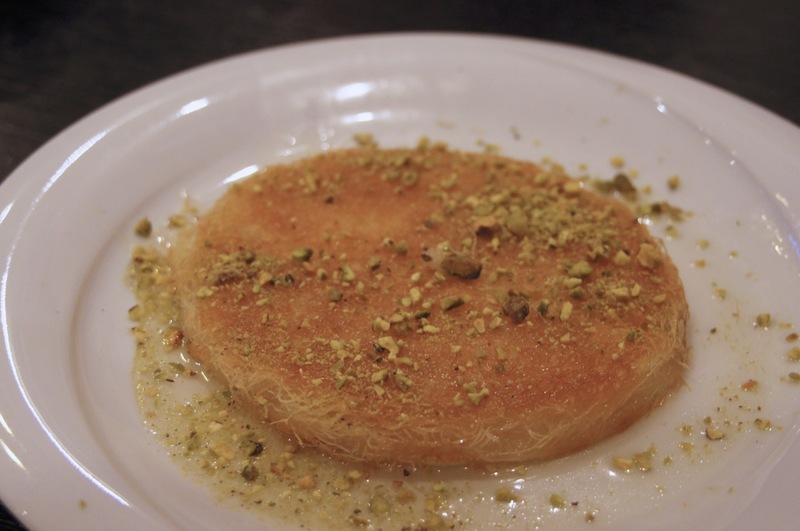 We ended the dinner with Kanafeh, which was warm kataifi (shredded filo) pastries sprinkled with chopped pistachios and doused in orange-blossom honey. When pulled apart, hot cheese oozes out. And it was incredibly sweet. Nice, but not too be taken in large portions. 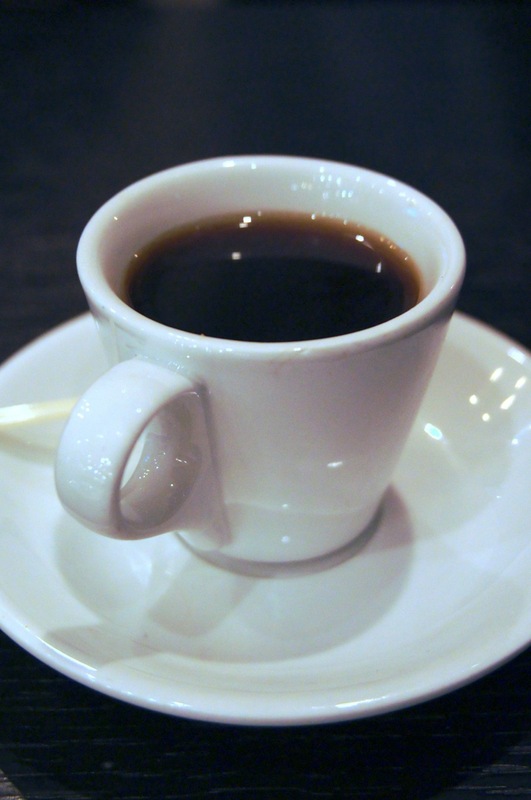 Meals end with tiny shots of coffee with cardamom seeds clustered at the bottom, their aroma permeating the exotic, murky brew. 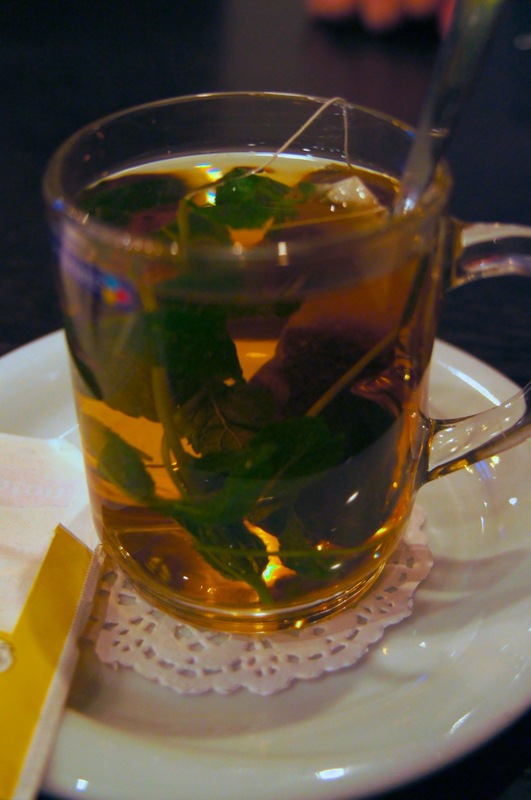 For those less accustomed to such strong brews can opt for regular mint tea – a tad of disappointment because it was just regular tea, not the brewed versions you get in other middle eastern countries. The decoration was quite rustic with mosaic floors and walls. Service was attentive but spoke little english, although an english menu was available, one should be careful to use it instead of pointing the Hebrew menu, as I found out that in Israel, the two menus may be different (both in items and their sequences, as well as price?). Recommended to put this in the itinerary if you are in Jaffa.